Welcome to Pure Entertainment, Professional DJ and Emcee services. We offer exceptional service that can guarantee success and fun for Weddings, Birthdays, Corporate Parties, Mitzvahs, and Special Events, all with affordable prices! When you consider various DJs in St. Louis, notice that Pure Entertainment has an extensive music library, high-quality audio sound equipment, great prices, and cooperative, enthusiastic, and professional personalities to service your event. 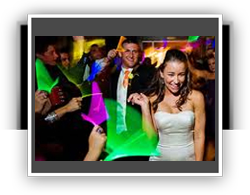 Our staff of experienced DJs play only the songs you want to hear and infuse your party with unlimited energy. Plus, Pure Entertainment is able to offer lights, photo booths, and Karaoke anywhere you need in the St. Louis Metropolitan Area. Are you getting married? Are you looking for St Louis Wedding Entertainment? If so, Pure Entertainment is your St. Louis Disc Jockey Service. Our Wedding DJ’s and MC’s bring a creative type of interactive entertainment to make your wedding stand out from all the rest. Our performers come prepared to transform any party, small or large, into a very extraordinary event that your guests will be talking about for years to come! Birthdays can be made even more special with a birthday party disc jockey, and we are certain we have the right birthday DJ for you! Let one of our birthday party DJ's keep the night's energy level at an all-time high. Whether it's Top 40 music, Country, 80's, or Disco, our DJs have the music and the experience required to meet your music loving heart's desire. We are set on making sure that your event goes exactly the way you want. 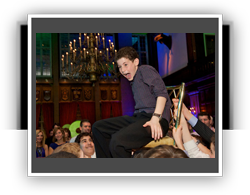 Pure Entertainment can make your child's Bar or Bat Mitzvah really exciting, with unique props, party favors, and interaction ideas. Our trained St. Louis DJs, Emcees, & Dancers will get everyone, young and old, dancing together, which is what a great party is all about. In addition, we can video the ceremony and reception to make a video montage that your family will cherish for all time. With the professionals at Pure Entertainment in your corner, hosting a Corporate Event or School Function has never been easier. Besides getting your staff, clients, students, & guests to let loose and have fun, we will also play great music selections. You get to hear both new and old hits, plus music choices that often get overlooked. We love music and want you to hear the Purest music around. Call now to book your fantastic performer. When your event has ended, you and your guests will be happy. This is our #1 goal. We love to perform and orchestrate a smooth flowing and stress free event. Call us at 314-256-9613 for a quote today.